Last month we had a week long vacation to Sardinia. You can watch the vlog here. I managed to stay keto the entire vacation, without too much effort. It was quite easy to stay keto actually. I did give myself a talking to before we came and I decided that I was going to do a totally keto vacation to show you guy that it absolutely can be done. I thought that I was going to fail at the first hurdle when we got to the lounge in the airport. It was all carbs. There were fresh croissants, cereal, doughnuts, crackers, sandwiches, nutella, jams, fruit juices and the hot option was Spanish rice. I hadn’t eaten anything yet and was starting to feel a bit hungry. I had planned to bring bacon with me (emergency purse bacon) just in case but I didn’t want to have to cook and clean up after I had already showered. I took a couple of the cheese sandwiches and took the cheese off the bread and ate that. I also had a couple of cups of coffee which filled me a bit. 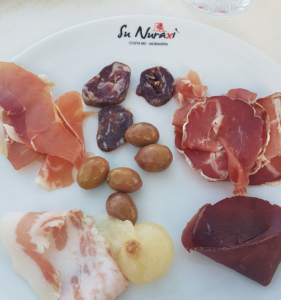 We flew with EasyJet and I was pleasantly surprised at the availability of keto food on the flight. I got a tapas box which had jamon serrano, chorizo and a tomato salsa that was, amazingly, sugar free! It was plenty to keep me going until we had dinner at the villa that evening. I didn’t track my carbs on this trip because I was eating keto the whole time so even when I went over slightly I wasn’t massively over. 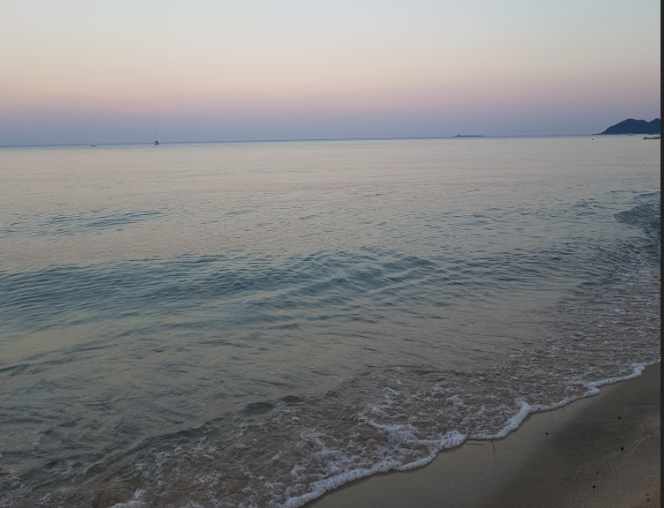 I also spent a lot of time swimming in the Mediterranean Sea and it was so hot I think I must have lost 5lbs in sweat alone! Sorry. Prepare in advance. Yes exactly like I didn’t do!! Make some bacon the night before, boil some eggs, pack a snack pack of salame or sliced cheese. Babybel is a great cheese for travelling with too. Be like a scout – always be prepared. Plan ahead. Research a little on supermarkets if you’re self catering and restaurants if you’re not. Luckily we’re both a little bit familiar with Italy so we knew we would be able to get plenty of keto food without too much searching. I did have an issue with chocolate though. I ran out of my Lindt 90% and didn’t bring any with me so I had to hunt a bit to find a grocery store that stocked it. Most shops only sold milk chocolate. Don’t be too shy to ask the wait staff how the food is prepared. If you suspect something might be breaded ask. Ask if any of the dressings have sugar in them. In Italy it’s not common at all for savoury food to contain any sugar, even the sauces. Most are based on olive oil or cream. If you order a steak without any sauce don’t be afraid to ask for olive oil to use on it. You might get some strange looks if you ask for butter and they might not have any available. Try to go for roasted or grilled food rather than fried as even in Italy, the spiritual home of olive oil, the food is usually fried in vegetable oils. Also don’t be afraid to ask for substitutions. I don’t like bell peppers and they always come as part of grilled vegetable sides. I simply ask them to leave them out and I’ll get more of another type of vegetable instead. If you decide to go off keto whilst you’re on holidays that’s ok. There are two ways to approach this. Give yourself a cheat day or cheat meal or go totally off for the entire holiday. I would prefer a cheat meal over a cheat day or cheat holiday simply because I know that one meal, while it may switch me from burning ketones to burning sugar, won’t make me feel too bad. I know if I have a cheat day or a whole cheat holiday then I feel sluggish, tired and won’t enjoy myself. It’s a personal choice but if you do decide to leave keto at home while you are on vacation don’t berate yourself for doing so. You’ve got a solid foundation on keto, especially if you’ve been keto for a while, so switching back on when you get home won’t be too painful. However, if you think that it will be a slippery slope to a total carbfest then maybe try to stick with keto. It can be done! If you have any tips or tricks for staying keto on vacation make sure to leave it in the comments. Knowledge is power and the more we share the better we get!